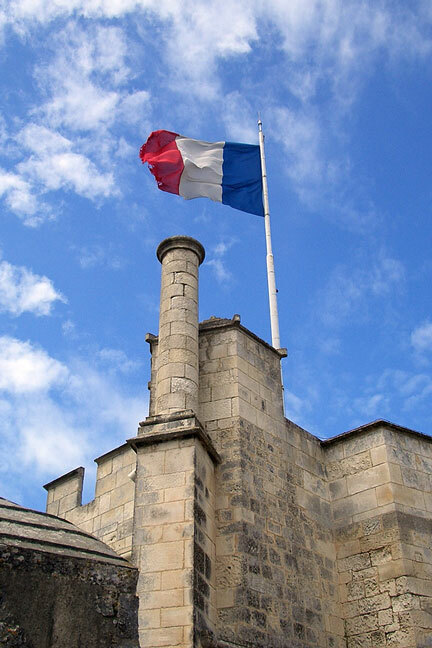 The French flag is one of the simplest flags, comprising three blue, red, and white bands of equal width. Until the Revolution in 1789, France was a monarchy. During the Revolution the Tricolore, or the emblem with equal-width vertical bands of blue, white, and red, was used. 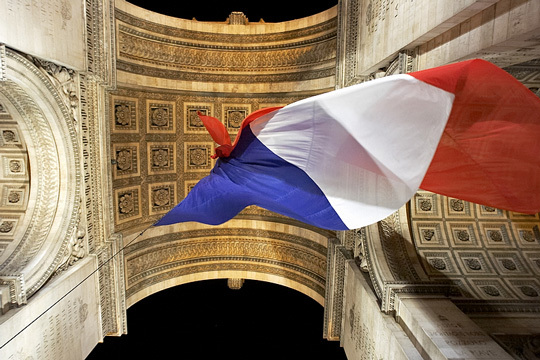 Because the Revolution turned France from a monarchy into a republic, the Tricolore is recognized as a symbol of freedom and liberty around the world. The Tricolore is also France's national emblem, as it has no arms. The colors were most likely settled on because red and blue are the colors of Paris, and white is the color of the House of Bourbon. However, over the years the colors have come to represent liberty, quality, and fraternity — all ideals associated with the French Revolution. 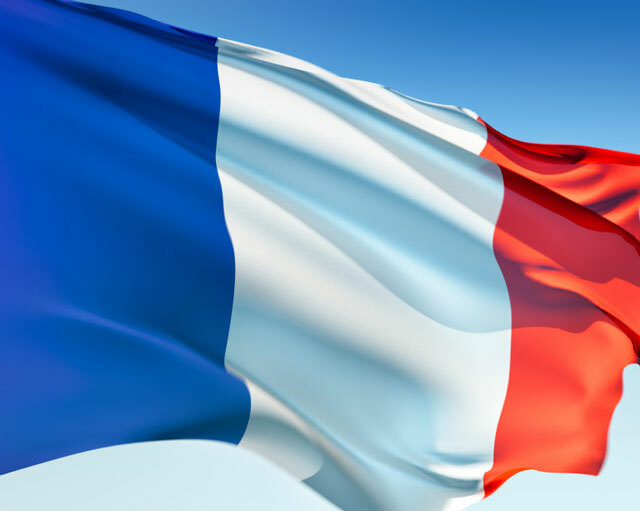 The design of the French flag is so meaningful that other countries have incorporated the Tricolore into their designs, and the colors red, white, and blue are frequently used by countries — including the United States — that promote liberty, equality, and fraternity. France is a country in Western Europe bordered on land by Spain, Belgium, Luxembourg, Germany, Switzerland, Italy, and the United Kingdom, and with a coastline that borders the English Channel and North Sea on the northwest, the Atlantic Ocean and Bay of Biscay on the west, and the Mediterranean Sea on the southeast. In addition to the land mass located on Western Europe, France is also comprised of several islands and territories located on other continents, including Saint Pierre and Miquelon in North America, Corsica in the Mediterranean, Guadeloupe and Martinique in the Caribbean, French Guiana in South America and Reunion in the Indian Ocean. With a total area of 547,030 square kilometers, France is the largest nation in Western Europe. The north and west are mostly made up of coastal lowlands, flat plains, and hills, while south-central France has hilly uplands. France's main mountain ranges are the Pyrenees (which also border Spain) and the Alps (which also border Switzerland and Italy. France is also home to several major rivers, including the Seine and the Loire, as well as the Garonne and the Rhone. These maps of France show France's geographical location as well as its major cities, highways, and natural features. France has a temperate climate that features both Mediterranean and oceanic climates. The oceanic climate contributes to cool summers and mild winters with very little year-round rainfall in most of the country, while the Mediterranean climate brings warm winters and hot, dry summers to the southern coast. Because France's land is so rich and fertile soil makes up almost half of the country's surface, it has an agricultural surplus that makes it a large exporter of food. Another thing that contributes to France's economy is the tourism trade. Because there are beaches, rivers, forests, mountains, as well as metropolitan cities, France is a great place to visit. Resorts and vineyard regions are also big draws for tourists. The country's capital of France, Paris, is the largest city with more than two million inhabitants. This means that a little more than 15 percent of the country's residents live in this city. The second largest city is the Mediterranean seaport city of Marseilles, with Toulouse, Nice, Nantes, Strasbourg, Montpellier, and Bordeaux also important cities. France Facts - information about France and its flag. France Diplomatie - French Ministry of Foreign and European Affairs. France Map - France maps, geography, and tourism. France News - news articles and facts about France.